In 2011 we got serious about updating the primary tool we’ve used for 36 years to educate our community about recycling and Zero Waste, our newsletter the Eco-Cycle Times. We spent many hours going over feedback from you, the public, as well as from our own staff, working to create the most comprehensive sustainability guide we could. We spent a year brainstorming, rethinking, redesigning, editing and re-editing what became the Eco-Cycle Guide: Your Resource for Living an Eco-Lifestyle and Building a Sustainable Community in Boulder County, a 36-page reference guide/newsletter/eco-living magazine printed on 100% post-consumer recycled paper (as always). It was published in April 2012. The 36-page guide is so comprehensive, we’ve decided to print it annually rather than twice per year (like we did with the Eco-Cycle Times). To make it more reader-friendly, and to minimize the “articles” and expand our resources for you, we’ve split the guide into two parts: The first is a full overview of the sustainability goals we’re working toward as a community. It includes how each sector in Boulder County fares in moving toward Zero Waste and how you can participate in those community efforts. Part 2 is our Eco-Living Guide, filled with tips and tools to help you reduce your waste and energy footprint, reuse as much as possible, and of course, give you everything you need to recycle and compost. We also recently launched our web version of the Eco-Cycle Guide, complete with the ability to share articles and comments. We hope you get as much out of reading it, referencing it and sharing it as we have making it. Thanks so much for reading. We’d love to hear YOUR thoughts on the Eco-Cycle Guide – email us and let us know! The Eco-Cycle® Guide is printed on 100% post-consumer recycled paper (no trees!) with non-VOC soybean-based inks. It is printed using a commercial cold-web press, which is less energy- and ink-intensive than the processes used to print glossy magazines. No part of this publication may be transmitted or reproduced in any form without the express permission of the publisher. 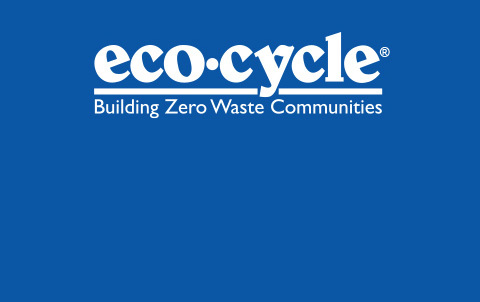 The Eco-Cycle® Guide is published by Eco-Cycle, Inc. to provide educational services, programs and materials in support of the environment, natural resource conservation, recycling and sustainable resource management through the concepts and practices of Zero Waste. Eco-Cycle is a Colorado non-profit organization and is tax-exempt under IRS Code 501 (c) (3). The Eco-Cycle® Guide is distributed primarily by volunteers in Eco-Cycle's Eco-Network. If you wish to receive this publication at your home, call or email us to be placed on our mailing list or subscribe online. To help us get this information to all your neighbors, email us to join the Eco-Network. 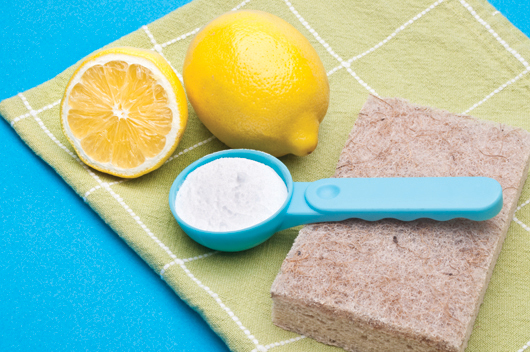 With just a few basic and inexpensive ingredients you may already have, you can scrub, scour, deodorize, disinfect and cleanse your entire home without the toxicity of conventional store-bought cleaners. • White Vinegar – This wonder liquid is a natural disinfectant that cleans and deodorizes, among other things. NOTE: Never use vinegar on marble as it will etch the surface. • Hydrogen Peroxide – A go-to in hospitals for disinfecting, hydrogen peroxide is also a mild whitener. Important: Don’t mix vinegar and hydrogen peroxide! It can create peracetic acid, which can cause irritation to the skin, eyes and respiratory system. • Baking Soda – This cleaning staple is a naturally-occurring mineral. It cleans, deodorizes, softens water and is a good scouring powder. • Castile Soap – Castile soap biodegrades safely, is non-toxic, and is available in grocery and health food stores. Be sure to look for plant-based castile soaps, NOT “liquid soaps” made from petroleum-based detergents. • Lemon Juice – It cleans, cuts grease and freshens. - Option 1: 1 part vinegar and 1 part water in a spray bottle. You can also add a few drops of essential oils like lavender or lemon to mask the scent. Mix 1 part vinegar, 2 parts water in a spray bottle. 2-3 tbsp. liquid castile soap. Here are alternatives to conventional pre-soaks and bleach for tough stains. Test each of the following remedies on a corner of your fabric first. Wash after application. Blood: Soak in cold water or (for whites) in hydrogen peroxide, and rub with soap. Ink: Rub with rubbing alcohol or hydrogen peroxide or soak in milk before washing. Fruit and Wine: Immediately pour salt or hot water on the stain and soak in milk before washing. Coffee: Mix egg yolk with lukewarm water and rub on stain. Lipstick: Rub with shortening and wash with washing soda. Mildew: Pour strong soap and salt on the spots and place in sunlight. Keep the spots moist, and repeat as often as necessary. Grease: Pour boiling water on stains and follow with dry baking soda. Don’t want to make your own cleaners? Check out our Eco-Store for truly planet-friendly cleaners. Most cleaners on the market contain dangerous solvents, acids and other hazardous chemicals that have been proven to cause irritation to the nose, eyes and lungs. They can also cause asthma and be carcinogenic. These chemicals, often called Volatile Organic Compounds (VOCs), are released into the air as you clean and contribute to indoor air pollution, which can be 2-5 times worse than outdoor air pollution. They’re bad for the environment too: Synthetic chemicals and detergents in cleaners flushed down drains contribute to water pollution. On the other hand, do-it-yourself cleaners are easy to make and will save you money, prevent plastic waste, and keep your family and home clean and healthy. Thanks to the Eco-Cycle Schools Department for much of this information, taken from their program on household hazardous waste, designed to protect kids from these harmful effects. © 2012 Eco-Cycle, Inc. All Rights Reserved No content published by Eco-Cycle may be copied or printed for any use without the expressed written consent of Eco-Cycle. Want to reprint or redistribute our content? Please contact us. They create pollution during production and disposal, are made of precious resources, and are downright unnecessary. In no particular order, here are our top 5 most wasteful single-use disposable items to always avoid. Polystyrene Foam (aka Styrofoam) To-Go Containers and Cups – Polystyrene is bad for you, the planet and the people who produce it. Its basic component, styrene, is a possible human carcinogen, a hazardous air pollutant, and can cause nervous system impairments among industry workers. Styrene can leach from containers into your food. 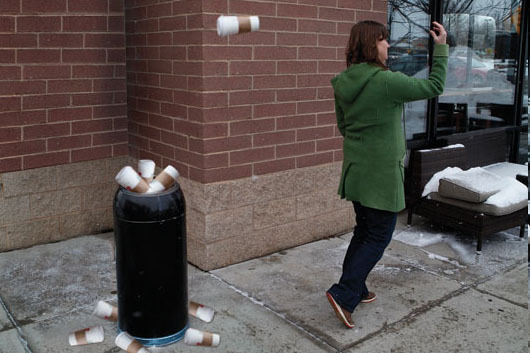 More than 530,000 tons of polystyrene containers and packaging are trashed every year. Polystyrene can’t be recycled and never biodegrades; it only breaks down into tinier and tinier pieces, polluting the environment and harming the animals that mistake it for food. Bottled Water – This single-use item is a poster child for unnecessary waste. Only 60 – 70% of the water used by bottling plants ends up in the final product after manufacturing and filling bottles, filtering water and cleaning the facility. But water isn’t the only resource wasted: It takes more than 17 million barrels of oil per year to produce the plastic for bottles. We’re consuming half a billion bottles of water each week, and the final kicker: Only 20% of these bottles are recycled. Plastic and Paper Shopping Bags – Banning plastic bags is a hot topic these days (see page 5), but many don’t realize paper bags can be just as bad—or worse—for the environment during production: Paper bags use more energy and create more water pollution during production, and are frequently made from old-growth trees. 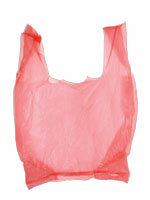 Plastic bags are made from non-renewable fossil fuels, fewer are recycled, and more are used. It’s a lose-lose either way. Plastic Utensils, Single-Use Chopsticks and Paper Napkins – An estimated 40 BILLION non-recyclable, petroleum-based plastic forks, spoons and knives are used every year in the United States alone. 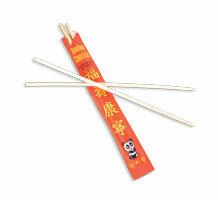 Single-use paper napkins and wooden chopsticks put pressure on our forests and should be avoided. These are our staples for a Zero Waste lifestyle. Experience tells us that as you get used to incorporating these products into your routine, they’ll become habit and you’ll never want to go back! Reusable Coffee Mug – We’re most fond of stainless steel and porcelain mugs as they won’t leach potentially harmful chemicals into your drinks. Check out Klean Kanteen’s Wide Insulated Mug, a triple-purpose product that can also be used as a water bottle or food container! Sturdy and Safe Food Containers – These are critical for packing waste-free lunches and avoiding single-use to-go containers at restaurants. Any reusable container will do, but we love the roomy To-Go Ware stackable “tiffins,” which can come with small “sidekick” containers for condiments or snacks and a bag to make your eco-choice more fashionable and discreet. 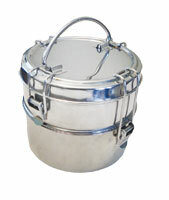 Find this product and other safe containers on our Eco-Store at www.ecocycle.org/ecostore. Avoid any plastic containers with a #3 (PVC) or #6 (polystyrene) as these are toxic plastics. Reusable Water Bottle – Fill your own bottles with tap water to easily avoid loads of unnecessary waste. Stainless steel bottles are the best as they don’t leach—check out our 27 oz. Eco-Cycle Klean Kanteen on our Eco-Store. If you’re going for a lightweight plastic, make sure it’s a “safe” plastic (#1, #2, #4 or #5) free of the hormone-disrupting chemical Bisphenol A (BPA). Be wary of aluminum bottles as their linings can leach and may contain BPA unless otherwise labeled. 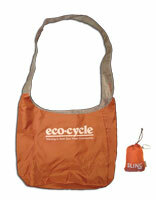 Reusable Bag – We like the ChicoBag (made from 99% recycled materials) so much, we put our name on it and sell it on our Eco-Store. You can stuff it into the attached sack for easy storing. Keep it in your pack/purse and you’ll never forget to BYOB(ag) again. 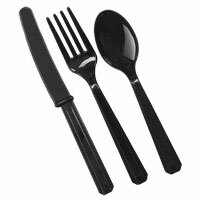 Durable Utensils, Reusable Chopsticks and Cloth Napkins – Keep a pair of reusable utensils wrapped in a reusable napkin in your bag or your glove box, and you'll be surprised at how many disposables you'll avoid when eating on-the-go. To-Go Ware offers beautiful bamboo utensils (chopsticks included!) and a utensil holder made from recycled plastic with a carabiner. These reusable to-go items are available at our Eco-Store at www.ecocycle.org/ecostore and through local health food stores and natural grocers. Find all these materials and much more on our Eco-Store. Are you a reuse muse? 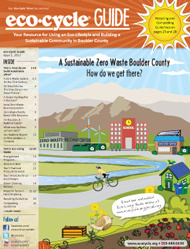 Join our campaign to encourage reuse by individuals and businesses in Boulder County. Reducing waste isn’t just about keeping stuff out of your trash can. It’s about making smart choices as consumers to prevent the destruction of our natural resources—trees, water, petroleum and the like—that are used to make unnecessary, single-use or otherwise trashy products. The following five pages have simple ways you can have your products and a clean environment too. Eco-Cycle has partnered with Catalog Choice—the best mail preference service in the nation—to stop unwanted waste in Boulder County and make this $20/account service available to residents and businesses at no charge. Getting rid of unwanted mail has become a daily ritual in our culture. Piles of flyers, coupons and even phone books show up on our doorsteps unannounced. Sure, we can recycle it all and feel good about that. But there is a much bigger environmental problem with junk mail that recycling can’t solve: Much of it is made from trees that are clearcut at an alarming rate from the Boreal Forest of northern Canada. These trees are not only home to hundreds of species of animals and thousands of species of plants, but they are also essential to one million indigenous people who live in the forest. We need to prevent the destruction of these forests in the first place—enter our newest service: Stop Junk Mail for GOOD. 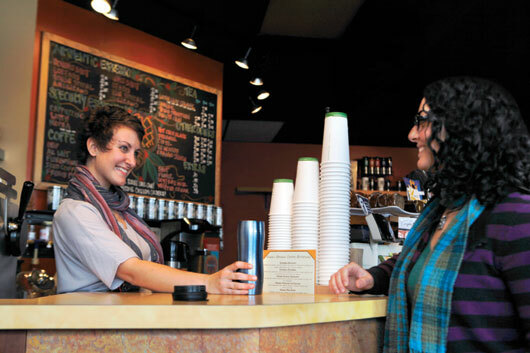 The service, worth $20/account, is available to you as a Boulder County resident or business at NO CHARGE. You can choose which pieces of mail you don’t want and make your name and address “unlisted” to prevent marketers from sharing and selling your personal information in the future. 1. Click the “sign up” link and then fill out the form to set up your free account. 3. Enter the names of catalogs, phone books and companies that send you mail you do not want. Eco-Cycle is footing the bill to make this Zero Waste service available to all Boulder County businesses and residents free of charge. You can help us cover our costs by donating directly to this campaign. Donate $10 or more online at www.ecocycle.org/junkmail. Unless you adopt five important new habits, you may find yourself right back on those marketers’ lists. #1: Use the magic words “Please do not rent, sell or trade my name or address” EVERY TIME you give out your address, whether you’re placing an order for a product, making a donation, or when a cashier at a store asks for your info. # 2: Prevent credit card and insurance offers – Reduce your junk mail and protect your identity by preventing "pre-screened" offers. Visit www.optoutprescreen.com or call 1-800-5-OPTOUT. # 3: Prevent charity solicitations – If you contribute once a year to a charitable organization, ask them to send you only one donation request per year, or ask if they can send you a paperless request via email. # 4: Watch out for warranties, contests and free offers – Their purpose is often to obtain your name for mailing lists or to sell you something. If you do sign up for one, be sure to use the magic words (see #1). # 5: 1-800-NO THANKS – When you receive a catalog or publication you don’t want, take the 30 seconds it requires to nip it in the bud. Call the company’s 1-800 number to have your name removed from their list. Seattle, WA is the first community in the country to require phone book manufacturers to fund an opt-out program so people can stop unwanted phone books, and to reimburse the city for its costs to collect and recycle old phone books every year. San Francisco, CA is running a three-year pilot program where residents do not receive phone books unless they opt in to receive a book.